What a magnificent race!!! I flew down to Cape Town on Friday afternoon and was feeling a little uneasy about the race coming up the following day. Usually I would have been very focused on only the race and wouldn’t have partied at all the previous week. But alas, I was only in SA for a few weeks and the people wouldn’t let me do my own thing. Although I had been doing all my carbo-loading etc, it wasn’t the way that I normally would’ve prepared for such a big race. The Expo which is an exhibition of all the race sponsors and where one can buy race memorabilia, etc, was once again a huge success. 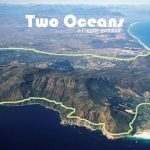 In all honesty Two Oceans must be the best-organized race in the country. Upon arrival at UCT (where the race ends and where you collect a race number and information pack) all you need to do is present the race entry registration card (which would have been posted earlier) and they give you your number. The next step is to ‘swipe’ your championchip over the mat to ensure that the timing devices are able to pick up the signal when you go over the timing mats in the race. For those not familiar with the Championchip system, it’s a little device that laces into the shoelaces. At certain points in the race the runner runs over a timing mat which registers the chip number and then automatically transfers the information into a database which can then be accessed to give split times, position in the race etc. After the Expo I went to my friend’s house where I was staying for the weekend. I unpacked and then relaxed. Around 18:30 we went to an Italian restaurant for some pasta. This was the final topping up before the race. I got home around 21:30 and went to bed. I got up on the race morning at 04:30 feeling a little nervous. Running a Two Oceans silver is the most difficult Silver in the whole country. I had come a long way to try and get another one. Although my preparation and training had gone very well indeed there is always that little bit of doubt in your mind as to whether you’ve done enough, whether you’re going to make it or not, what happens if you get a cramp etc. I got to the start at 05:30, and met my fellow running mates. I was running with Frank Da Ascencao and Yolandi Maclean. Frank is a old campaigner. He has done 19 Comrades already, with the last 18 being silvers medals. Only one of them over seven hours. What makes it more impressive is that he has done the last 18 without missing a single year!! Yolandi on the other hand is a relative novice, although she has a huge amount of talent. She basically has won every race she has entered. In the last two months she has won 2 marathons, a 50km ultra marathon (where she also broke the record), and has been training around 135 – 150 km per week. Our goal was for all of us to get silver medals and to help Yolandi get a good position in the ladies race. With the prize money ranging from R150 000 for the 1st lady to R1 000 for the 10th lady, every position meant more money! 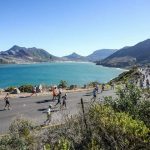 To run for a silver Two Oceans one has to run at an average pace of 4:17/km. This is not an easy task with two tough climbs, namely Ou Kaapse Weg and Southern Cross Drive. Our race strategy was to go out and run 4 min/km for the first 25 odd kms until we got to Ou Kaapse Weg. This would be the real tester. It’s about 6km long and if one runs it too fast getting a sliver will be impossible. We wanted to run an easy 5min/k up to that point knowing that we would have already had made up lots of time by running the previous 25 at 4 min/km. From the top of Ou Kaaps to the bottom there is a very steep decent of about 3 km. If you go down this too fast, you will hurt your legs and the race is most certainly over. We planned to run 4 min/km again from the top of Ou Kaapse Weg to the beginning of Southern Cross drive which is approximately 44km. From there it would be another 5min/km up Southern Cross Drive which is about 2,5km long. From this point onwards one only has about 8km to go and with enough time one can run around 4,20/km.